It's time again for the Samhain edition of the Healing Wheel workbook! 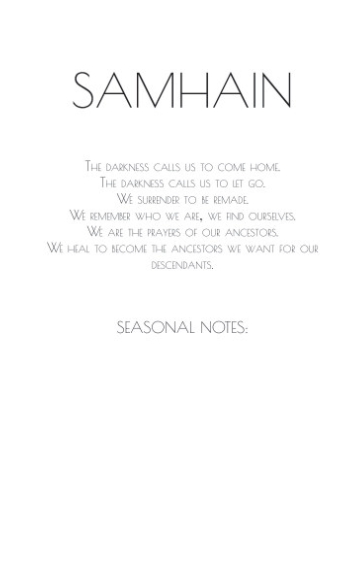 This workbook takes you from Samhain through the Wheel of the Year, supporting you in aligning yourself with the seasons and the rhythms of the Earth. It includes a tarot spread, information about each holiday in the wheel, daily practices and exercises, astrological information, writing prompts, altar suggestions, and rituals for each holiday. This workbook was created in magical space for every step except the printing. Everything in it was chosen by the beings supporting me in this work. It carries with it a magical intention. It has been charged with this intention in sacred space, and carries with it protection for the work that is done with it. The intention of this workbook is to honor and strengthen the relationship between our individual and collective healing and to support people in aligning themselves with the rhythms of the Earth. As part of how I personally fulfill my intention of strengthening the relationship between individual and collective healing, half of the money made from the sales of this workbook will be donated directly to Indigenous groups taking the lead on healing and protecting the Earth. Last year's donations went to Standing Rock. This year I will be looking at various efforts on the west coast and giving to one or more of them. These include the efforts to stop the LNG in Tacoma and efforts to remove dams that are affecting salmon runs. Efforts to align ourselves with the rhythms of the Earth are directly linked to centering Indigenous wisdom, as it is colonization that has caused us to fall out of step with the Earth. Indigenous leadership is crucial for the healing of the Earth. All of us, of any lineage, are nurtured by the land, and the land is not separate from those Indigenous to it. This workbook is rewritten every year. There are two reasons for this. One is to account for the astrological differences from year to year. The other is because the spirits set the magic. In making space for them to offer different rituals every year, I am making space for the magic to build on itself and to be responsive to our changing needs. If you so desired, you could use the same copy of the workbook every year. There is a powerful magic in exact repetitions. However, there are also shifts in the energy of what we are collectively dealing with each year, and accounting for those shifts is another way of linking up personal and collective healing. Workbooks are $15. Shipping (in the US) is $5. To order, please contact me via email or Instagram (click icon at bottom of page). Workbooks are soft cover, 6x9 inches. Contact me for international shipping options. Wholesale is available, and carries with it the commitment to honor the donation magic.